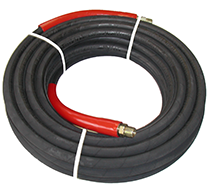 Pressure Washer Hose and assemblies are available in a wide variety of styles including one and two wire braid reinforced hose. Pressure ratings of 3000 PSI (single braid) and 6000 PSI (dual braid) are available. Black oil resistant fabric impression cover is standard, blue cover and non-marking covers are also available (some sizes). Our standard wrapped cover can be replaced with a slick extruded smooth cover by special order. Pressure washer hose is assembled in 50 & 100 Ft lengths with bend restrictors and male X male swivel couplings attached. Custom assemblies are also available by special order (most sizes). We also offer food plant washdown assemblies for high temperature water service. We carry a variety of quick disconnect couplings, wands, spray guns and nozzle tips – Contact us for further information (See PDF below for quick coupling information).